Last week, the little island nation that lies at the footstep of India received massive embarrassment on a global stage, as various nations, including India, refused to attend the Annual Commonwealth Summit Sri Lanka was holding. Worse still, leaders of all these countries clearly stated why they refused to go – citing the country’s poor human rights record, and the government’s failure to investigate human rights violations committed there. A number of top leaders, along with global media, launched into full-fledged criticism of President Rajapaksa and the things he has done in the country. So, the question: why does everyone seem to hate the President of Sri Lanka? 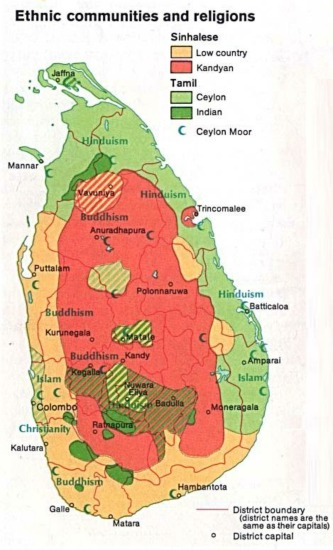 In our article on the Jaffna Elections (Issue 18), we explained quite a bit about the Sri Lankan civil war and the Tamil-Sinhalese conflict, and also touched upon the brutal military assault launched by Rajapaksa to end the civil war. As stated in that article, violence and rioting between the Tamils (migrated from India) and the Sinhalese (original Buddhist inhabitants of Lanka) in the 1980s resulted in the formation of the Liberation Tigers of Tamil Eelam (LTTE) – a terrorist group whose objective was to create a nation for Sri Lankan Tamils in the northeast Jaffna region. A 27-yr long civil war, fuelled by unhelpful Indian interference, peppered with assassinations and skirmishes, during which the LTTE controlled a majority of Jaffna, ensued – until Mr. Rajapaksa. In 2006, he became President and decided to destroy the menace of the LTTE once and for all. He broke all previous peace agreements and launched a full-scale invasion of LTTE-controlled areas; the strategy: kill everybody and everything in sight. In a concentrated and ruthless attack that killed over 7,000 civilians, mostly Tamils. Rajapaksa announced in mid-2009 that Prabhakaran (founder and leader of the LTTE) was dead, the LTTE base of operations had been destroyed, and Jaffna had been retaken – the horrible civil war was over; but at what cost? The final stages, and the aftermath, are a true tragedy. His opponents claim Rajapaksa has used the victory to suspend democracy and entrench himself and his clan in the Lankan halls of power – according to some, the country is run by four brothers and a son. It’s not baseless either: for example, the Press Freedom Index ranks them about the same as Saudi Arabia, where journalists are executed for saying anything against the ruling family. The 250,000 Tamil prisoners held by the Lankan army are said to have been tortured, and barred from equal treatment. In those last months of the war, shocking reports of deliberate bombing of hospitals, soldiers killing without distinguishing between civilians and combatants, indiscriminate bombing of civilian area and inhumane living conditions for civilian people in the area began to surface. And most glaring of all – those numbers – 7,000 civilians killed in the final stages, and 40,000 normal, innocent people slaughtered over the course of the conflict – most (not all) of the civilians killed were Tamils. The government wasn’t solely responsible: those who glorify Prabhakaran as a martyr and sympathise with the LTTE are beginning to realize that they committed almost as many humanitarian crimes as the government and killed many of the Tamils they claimed to be protecting. However, as David Cameron (first world leader to visit Jaffna) reinforced – a country’s government has committed atrocities on its own civilians, then denied it outright – celebrating their victories and making no efforts for reconciliation. This still unresolved issue is the reason for Sri Lanka’s, and Rajapaksa’s personal, embarrassment at the Commonwealth Summit.